The newest celebrity-themed game from Glu lets you rub shoulders with A-listers Kendall and Kylie. While it may take you ages to take a group selfie with them, let alone be their guest, it is as easy as 1-2-3 to befriend them in this game. Your journey from a nobody to a star starts soon after you become friends with these super starlets. You will get new projects, meet celeb bloggers and post Vlogs about your successful meet-ups to get more likes and followers. 1. Level Meter: Shows your current level. Complete goals, achievements to get XP. The XP you collect fills the level meter. You get XP by tapping on pointers and sharing posts with your followers. When the level meter fills up, you will get cash, energy refill and K-gems as level-up rewards. Your energy cap also increases by 1. If your total energy is 16, then leveling up will increase it to 17. 2. Energy: Shows how many energy is left and the energy cap. You can get 1 free energy by watching a video or completing offers. These offers include installing an app and doing certain tasks that will give you energy. For example: an offer app will tell you to down UC Browser and open to get 4 energy. There are several apps in the offers page. Make sure you complete an app-related task to get energy. 3. Cash: The total cash you currently have. Complete goals, achievements and tap on pointers to receive them. Vlogging events or sharing posts with your followers will also earn you coins. 4. K-Gems: K-gems can be used to chat or flirt with people. You will need these gems if you want to expand your contacts. Sometimes a person may take time to text you. With K-gems you will cancel the wait time and he/she will text you immediately. Basically, K-gems are premium currency that you can earn after leveling-up or completing an achievement. You can win items, tattoos and accessories by opening a gift box. A gift box may also contain stickers. Collect a set of stickers from a gift box to earn an accessory. Gift boxes can be opened for free. Once you open one, you will have to wait for hours, even a day or so to open another free box. There are three types of gift boxes: common, uncommon and rare. Common gift boxes give plain stuff, whereas the 3rd rare gift box gives some cool and stylish items. The next free common gift box will appear after a few hours, but it may take a week or so to get another free rare gift box. A free uncommon gift box usually appears after 2 days after opening one. If you hate wait times, then there are always K-gems, but I would suggest you use K-gems for other important stuff like adding contacts or decreasing wait times. 6. Camera: Lets you take selfies anywhere – the beach, an event or a restaurant. Tap on it to change backgrounds, add emoticons or people. You can even add stickers to your selfies. Once ready, you can share your selfie by posting it to your feed. Note: you won’t receive any rewards for posting your selfies. Chances of likes of followers for such selfies are also less. You will receive rewards if your vlogs and selfies are related to your goals. So if you have posted a vlog to your feed after completing a goal, you will get some rewards. 7. Contacts: This is where you will find a list of friends and acquaintances you have added. People you have chatted or flirted with will be added to your contacts. You can also invite your Facebook friends to help you out in completing goals. 8. Feed: Lets you view you recent vlogs, selfies and posts. 9. Wardrobe (Hanger icon): This is where you can change your character’s clothes, wear new accessories. You can buy new clothes and accessories by spending dollars. You will also get a list of unlockable clothes and accessories at the wardrobe. 10. Goals and Achievements: Shows a list of incomplete goals and a list of achievements. When you tap on a goal and press OK, icons related to that goal will jump on the game screen. These include, location icons, building icons and goal icons. Tap on achievements to check what it takes to complete one. There are various types of achievements and newer ones are added every now and then. You will earn XP, dollars, energy and K-gems after completing an achievement. 11. Followers: Shows the number of followers you currently have and also the follow club. Reach a new follow club to get gems, energy and money! Keep completing goals and post vlogs related to them to get likes and followers. Santa Monica: Pink Bicycle and Pigeon. LAX: Strolley near Terminal 1. You will have to spend cash every time you travel to a location, so it would cost you more if you just want to travel to a place just to tap on an object to receive bonus XP, cash or energy. Go to a location and tap on objects only when you have been assigned to complete a goal or project. To complete a goal, you will have to tap on pointers. Once you tap on a pointer, tasks will show up at the bottom of the screen. These tasks require energy points. A completed task drops stars. Tap to collect them and fill the star meter. Make sure you the energy bar is full when you accept a goal. In some goals, your friend Perry will ask you whether you are ready or not. You can choose yes if you have a full energy bar. Once you have used up all energy, keep coming back every 20 minutes to tap pointers and complete tasks. It will take 20 minutes to get a good amount of energy points. You can watch video or complete offers to get extra energy. Do remember that goals have a time limit. Anything less than 4 stars will be deemed average or failure and you won’t get much rewards or followers. So try to come back every 15-20 minutes, complete tasks and reach above 4 stars if you are looking for success! Getting five stars in a goal will fetch you more rewards and will also let you post a vlog or selfie that will earn you extra XP and cash as well as more followers and likes on your posts. Press Okay when you will be prompted to share a post and get your rewards. Tapping on the goals icon at the bottom right corner of the screen will give you access to a set of pending goals. Tap a goal to mark it and all pointers related to the goal will bob. The location where you will have to complete a goal will also be highlighted. Doing this, you won’t be confused about your goals and the location where you will have to complete them. To go on a date in Kendall and Kylie, tap on the heart icon, select a girl/guy you have recently flirted with and tap on “Text Now” to invite him/her. Next tap on the heart callout and tap “Start” to begin dating. Dating also has a time limit and tasks are heart-shaped instead of star-shaped so make sure you earn at least 4 hearts to make it a success. You can later post your vlog to your feed to earn extra rewards, likes and followers. When you date someone, you spend energy to complete date-related tasks. If you have too many pending goals, then try to complete them first and then you can date someone to earn extra rewards. Goals can be quite time-consuming because it requires energy to complete them. You may have to wait for minutes or an hour before the energy meter becomes full. 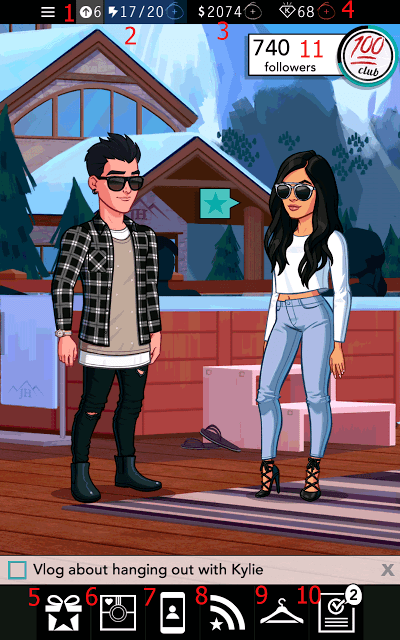 Adding friends in Kylie and Kendall game app lets you finish goals faster. When you are completing a goal, you can add friends to your projects so that they can lend a helping hand to your tasks. You can share your Game Center ID with your friends on our FB page if you are playing this game on your iOS device. Leaving your Game Center IDs on our FB page will let others add you as your friends. Also, keep an eye on their IDs and add them as friends.